(JUNE 10-14, 2016) An event celebrating the investiture of Robert Gramling, M.D., D.Sc., as the inaugural Holly and Bob Miller Chair of Palliative Medicine attracted wide coverage in local and regional media outlets. 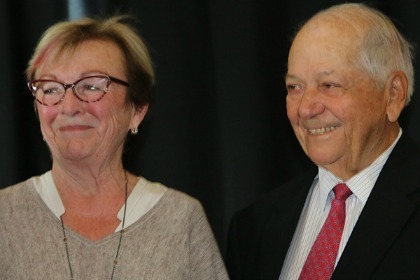 The position was made possible through a $3 million gift to the College of Medicine from the Millers, who for decades have supported palliative care and clinical services in Vermont. WFFF-TV Channel 4, WVNY-TV Channel 22, VPR, VT Digger, Times Argus, Vermont Business Magazine, Burlington Free Press, WCAX-TV Channel 3, The Washington Times, Hastings Tribune, Bryan-College Station Eagle.